Water Filters Fast provides water filters for all the big brands, including Whirlpool, Samsung, LG, and GE refrigerators, as well as lots of smaller kitchenware manufacturers. We know the importance of having access to clean, fresh, great-tasting water for you and your family, and we can supply your replacement filters quickly and cost-effectively. You can be sure you have come to the right place if you are looking to replace your Electrolux or Frigidaire water filter, but you can also find an array of water filters for other branded refrigerators throughout our site. Reduce your impact on the environment while improving your health and enjoying great tasting water. Using a refrigerator water filtration system significantly reduces a household’s plastic waste production, while also saving you the expense of bottled water and bags of ice. Electrolux is a Swedish-owned manufacturer and is ranked the second-largest home appliance manufacturer in the world after Whirlpool. Get safe, clean, and delicious water and ice in an instant with Electrolux and Frigidaire water filter cartridges. Our range of Electrolux refrigerator water filters removes the taste and odor of chlorine, contaminants, and impurities, but leaves the beneficial fluoride in your water for great-tasting and healthy water. Electrolux water filtration systems are tested and certified to ANSI/NSF standards so that you can be confident in their safety. Check the model numbers so each water filter will fit, ensuring you are buying the right one for your Electrolux or Frigidaire refrigerator. The filters should be replaced every six months or 400 gallons, whichever comes first, but you can gauge your own refrigerator’s performance and keep an eye on the indicator light. 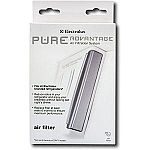 Browse our extensive range of water filter cartridges available for fast delivery.